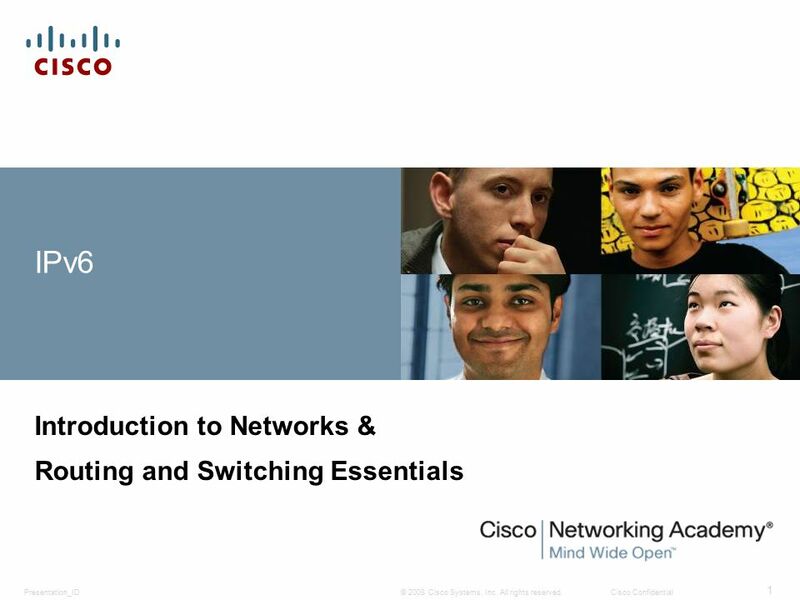 © 2008 Cisco Systems, Inc. All rights reserved.Cisco ConfidentialPresentation_ID 1 IPv6 Introduction to Networks & Routing and Switching Essentials. 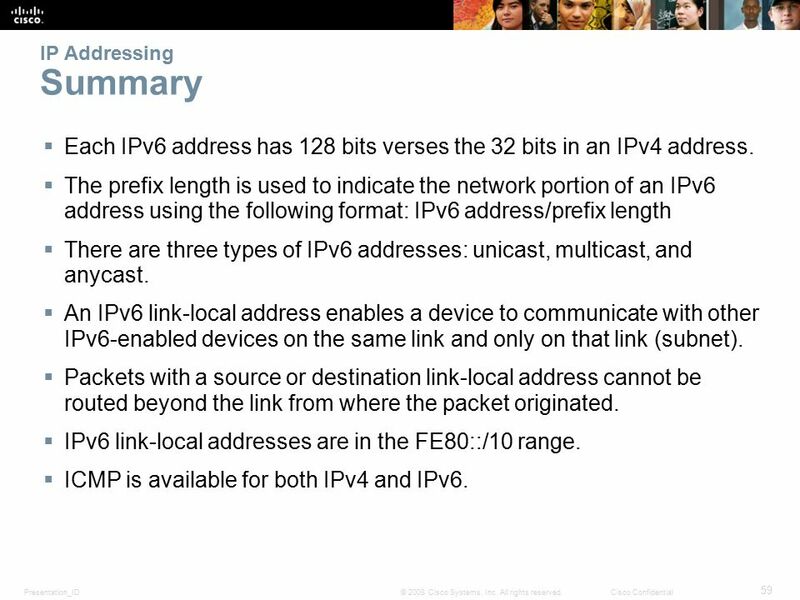 3 Presentation_ID 3 © 2008 Cisco Systems, Inc. All rights reserved.Cisco Confidential IPv4 Issues The Need for IPv6  IPv6 is designed to be the successor to IPv4.  Depletion of IPv4 address space has been the motivating factor for moving to IPv6. 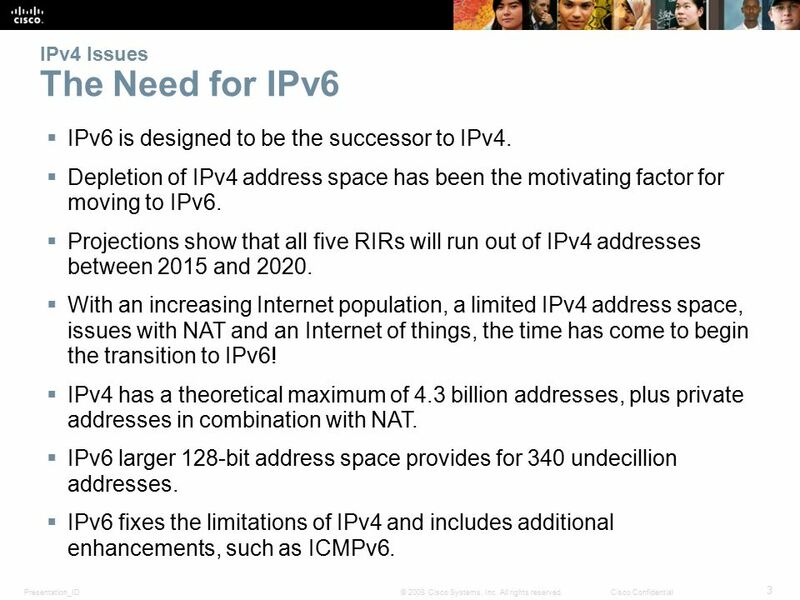  Projections show that all five RIRs will run out of IPv4 addresses between 2015 and 2020. 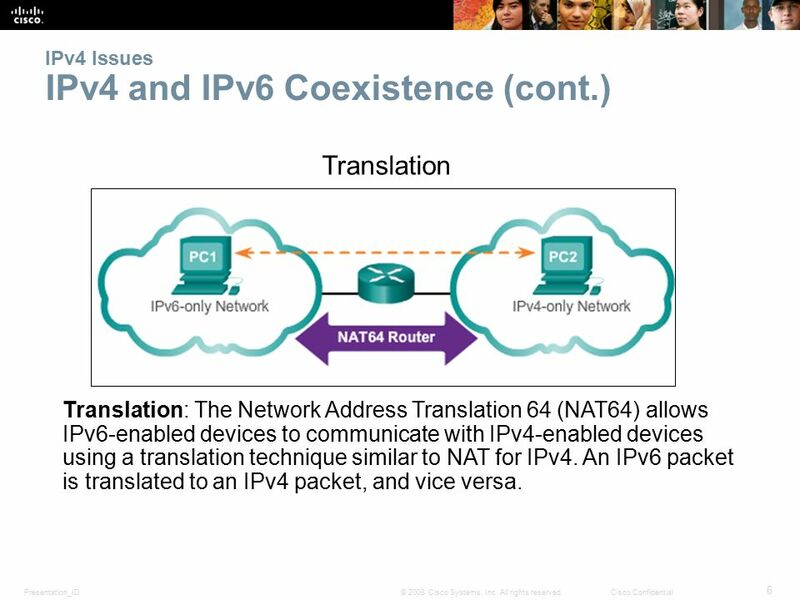  With an increasing Internet population, a limited IPv4 address space, issues with NAT and an Internet of things, the time has come to begin the transition to IPv6! 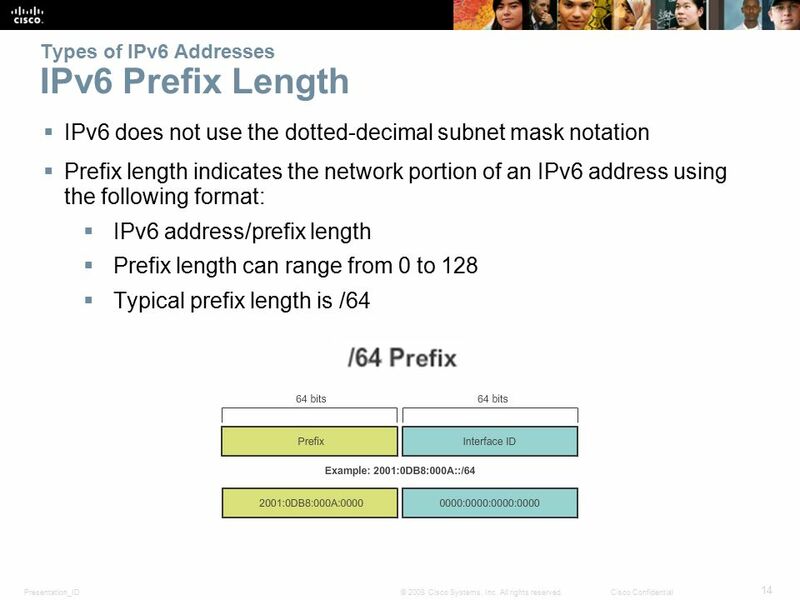  IPv4 has a theoretical maximum of 4.3 billion addresses, plus private addresses in combination with NAT.  IPv6 larger 128-bit address space provides for 340 undecillion addresses. 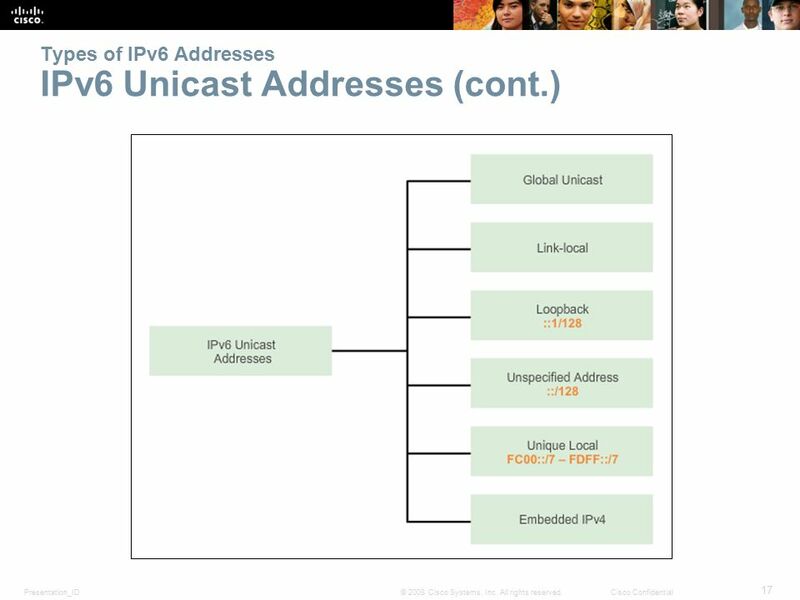  IPv6 fixes the limitations of IPv4 and includes additional enhancements, such as ICMPv6. 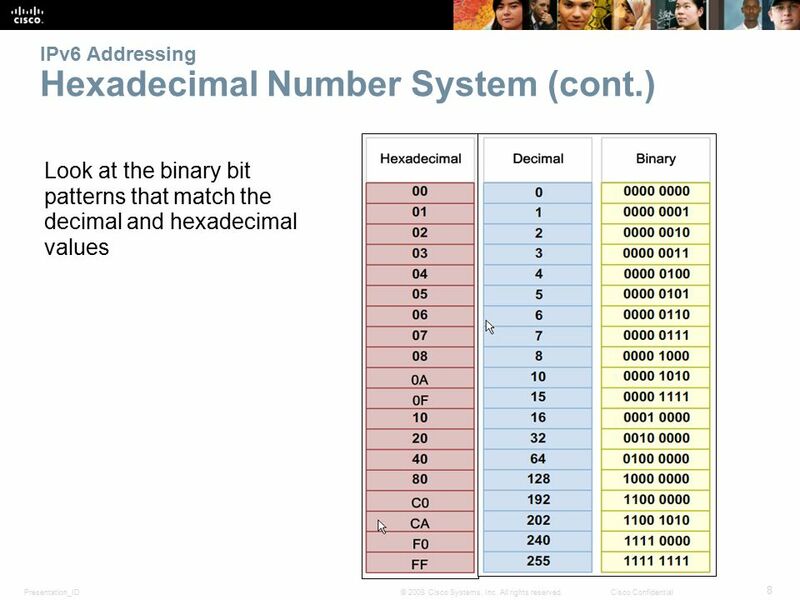 7 Presentation_ID 7 © 2008 Cisco Systems, Inc. All rights reserved.Cisco Confidential IPv6 Addressing Hexadecimal Number System  Hexadecimal is a base sixteen system. 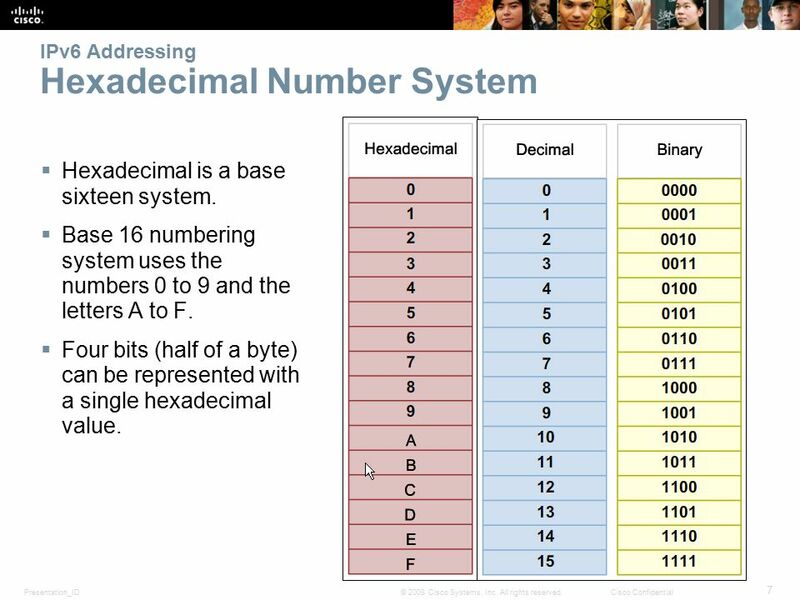  Base 16 numbering system uses the numbers 0 to 9 and the letters A to F.  Four bits (half of a byte) can be represented with a single hexadecimal value. 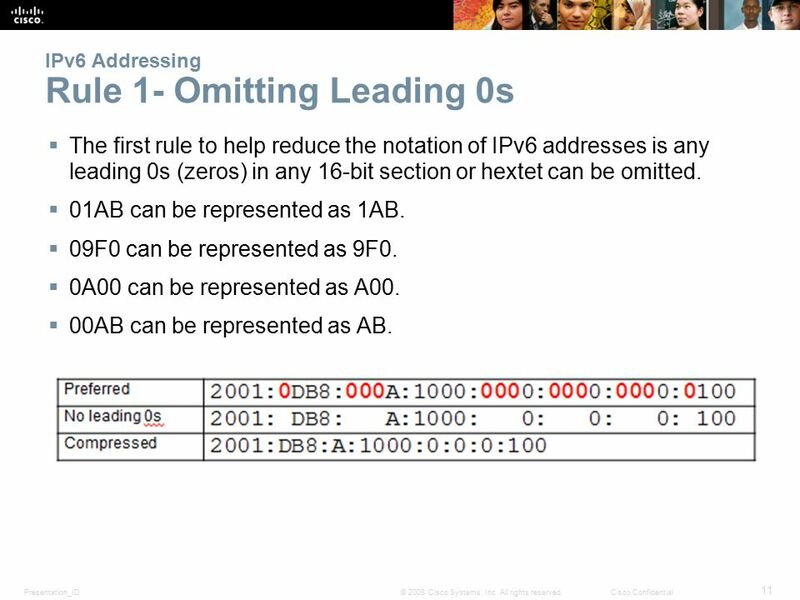 11 Presentation_ID 11 © 2008 Cisco Systems, Inc. All rights reserved.Cisco Confidential IPv6 Addressing Rule 1- Omitting Leading 0s  The first rule to help reduce the notation of IPv6 addresses is any leading 0s (zeros) in any 16-bit section or hextet can be omitted.  01AB can be represented as 1AB.  09F0 can be represented as 9F0.  0A00 can be represented as A00.  00AB can be represented as AB. 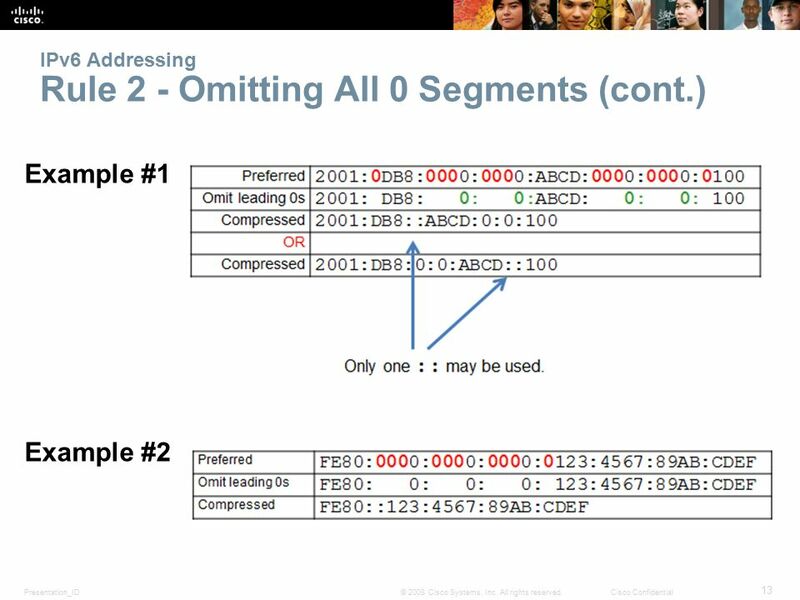 12 Presentation_ID 12 © 2008 Cisco Systems, Inc. All rights reserved.Cisco Confidential IPv6 Addressing Rule 2 - Omitting All 0 Segments  A double colon (::) can replace any single, contiguous string of one or more 16-bit segments (hextets) consisting of all 0’s.  Double colon (::) can only be used once within an address otherwise the address will be ambiguous.  Known as the compressed format.  Incorrect address - 2001:0DB8::ABCD::1234. 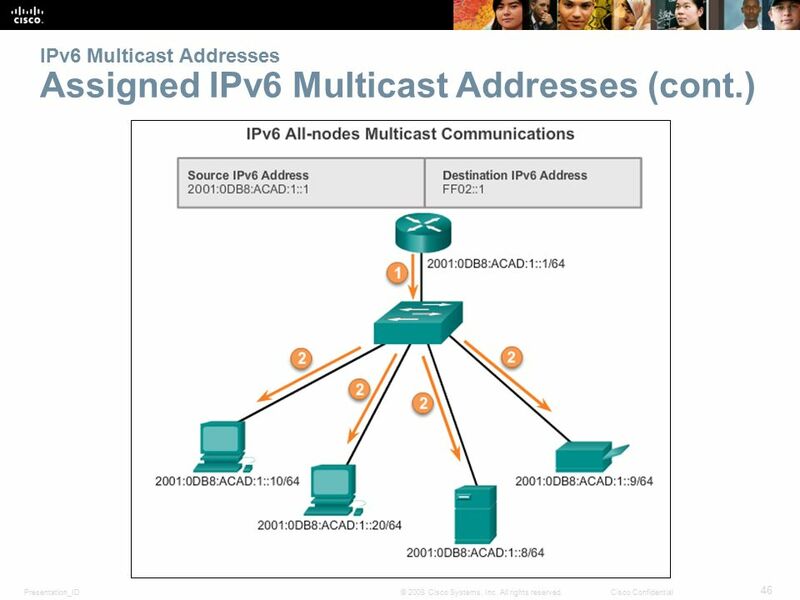 15 Presentation_ID 15 © 2008 Cisco Systems, Inc. All rights reserved.Cisco Confidential Types of IPv6 Addresses IPv6 Address Types There are three types of IPv6 addresses:  Unicast  Multicast  Anycast. 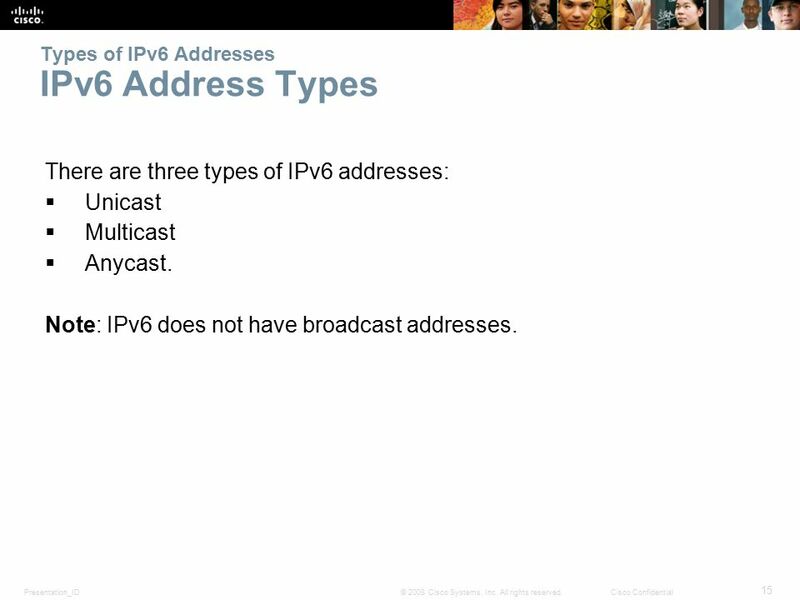 Note: IPv6 does not have broadcast addresses. 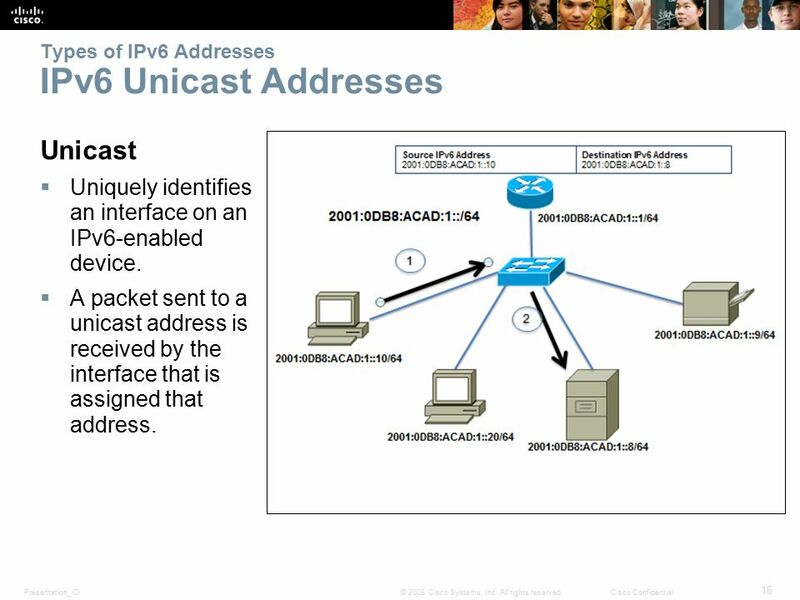 16 Presentation_ID 16 © 2008 Cisco Systems, Inc. All rights reserved.Cisco Confidential Types of IPv6 Addresses IPv6 Unicast Addresses Unicast  Uniquely identifies an interface on an IPv6-enabled device. 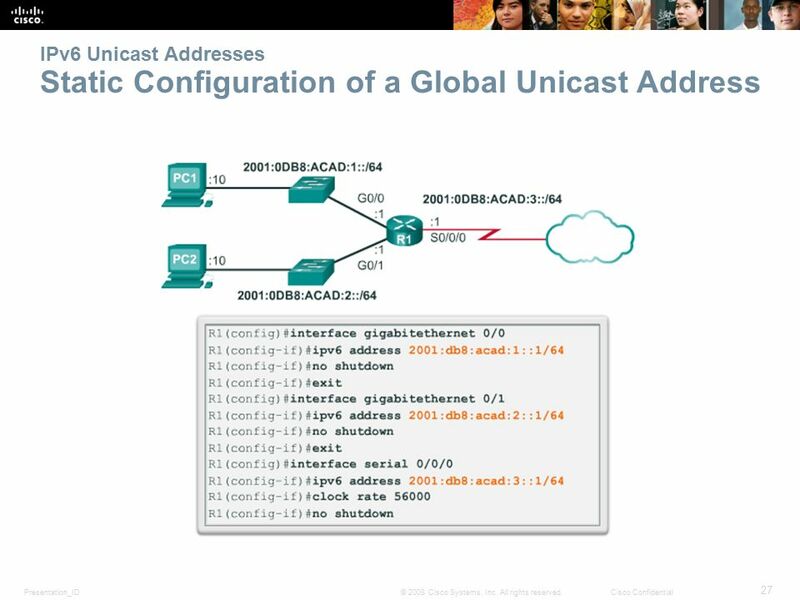  A packet sent to a unicast address is received by the interface that is assigned that address. 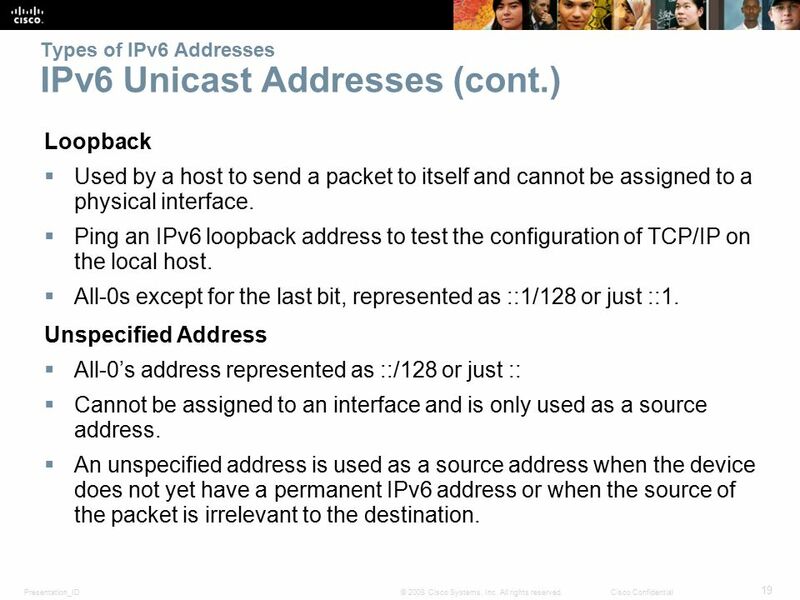 19 Presentation_ID 19 © 2008 Cisco Systems, Inc. All rights reserved.Cisco Confidential Types of IPv6 Addresses IPv6 Unicast Addresses (cont.) Loopback  Used by a host to send a packet to itself and cannot be assigned to a physical interface.  Ping an IPv6 loopback address to test the configuration of TCP/IP on the local host.  All-0s except for the last bit, represented as ::1/128 or just ::1. Unspecified Address  All-0’s address represented as ::/128 or just ::  Cannot be assigned to an interface and is only used as a source address.  An unspecified address is used as a source address when the device does not yet have a permanent IPv6 address or when the source of the packet is irrelevant to the destination. 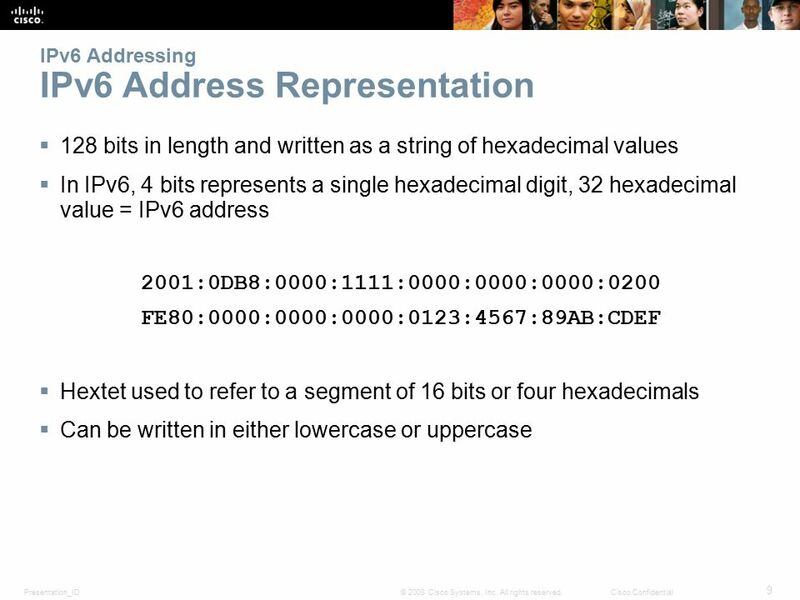 20 Presentation_ID 20 © 2008 Cisco Systems, Inc. All rights reserved.Cisco Confidential Types of IPv6 Addresses IPv6 Unicast Addresses (cont.) 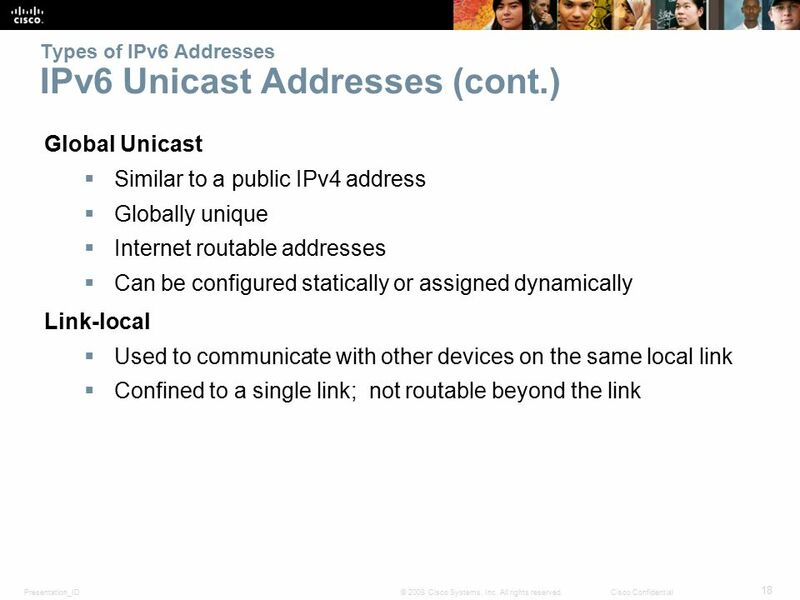 Unique Local  Similar to private addresses for IPv4.  Used for local addressing within a site or between a limited number of sites.  In the range of FC00::/7 to FDFF::/7. IPv4 Embedded (not covered in this course)  Used to help transition from IPv4 to IPv6. 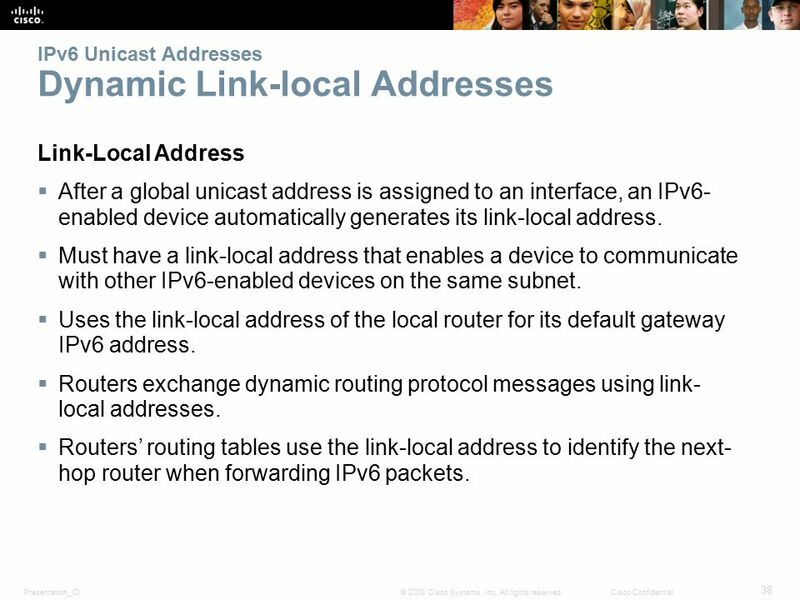 22 Presentation_ID 22 © 2008 Cisco Systems, Inc. All rights reserved.Cisco Confidential Types of IPv6 Addresses IPv6 Link-Local Unicast Addresses (cont.) Packets with a source or destination link-local address cannot be routed beyond the link from where the packet originated. 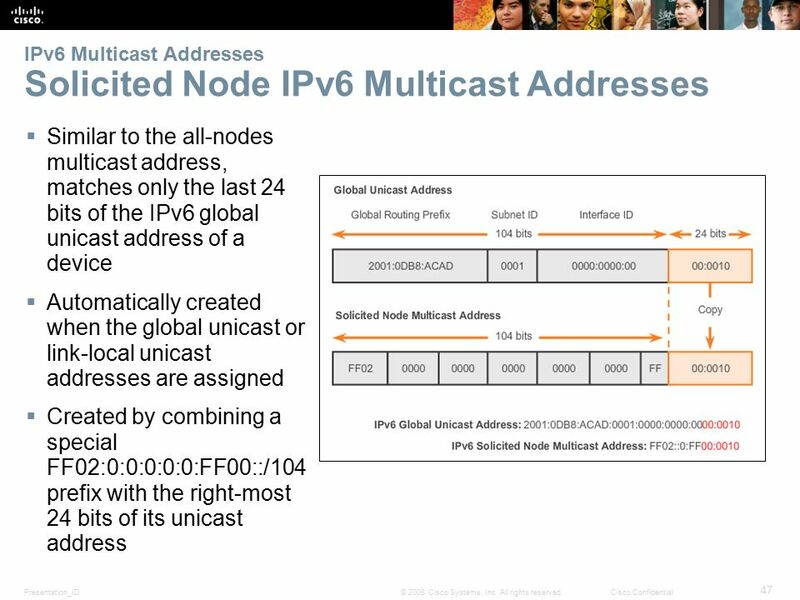 25 Presentation_ID 25 © 2008 Cisco Systems, Inc. All rights reserved.Cisco Confidential IPv6 Unicast Addresses Structure of an IPv6 Global Unicast Address (cont.) 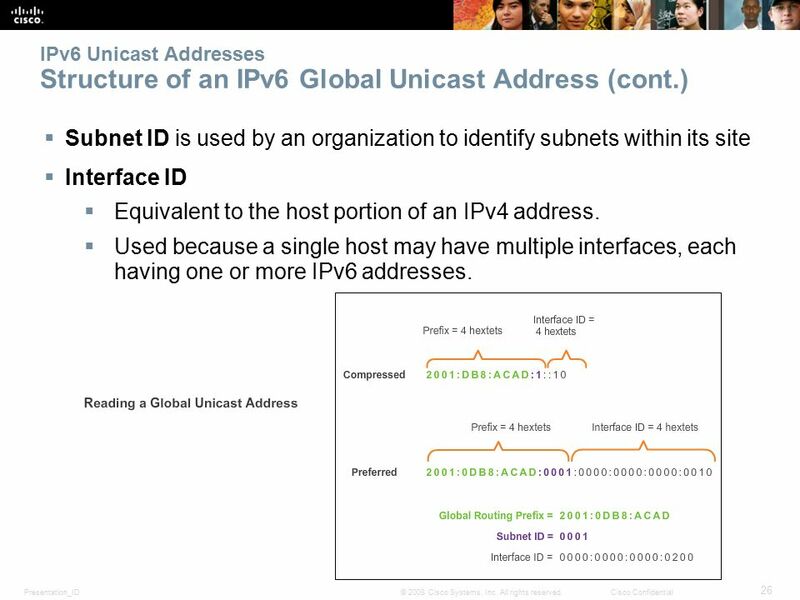 A global unicast address has three parts: Global Routing Prefix, Subnet ID, and Interface ID.  Global Routing Prefix is the prefix or network portion of the address assigned by the provider, such as an ISP, to a customer or site, currently, RIR’s assign a /48 global routing prefix to customers.  2001:0DB8:ACAD::/48 has a prefix that indicates that the first 48 bits (2001:0DB8:ACAD) is the prefix or network portion. 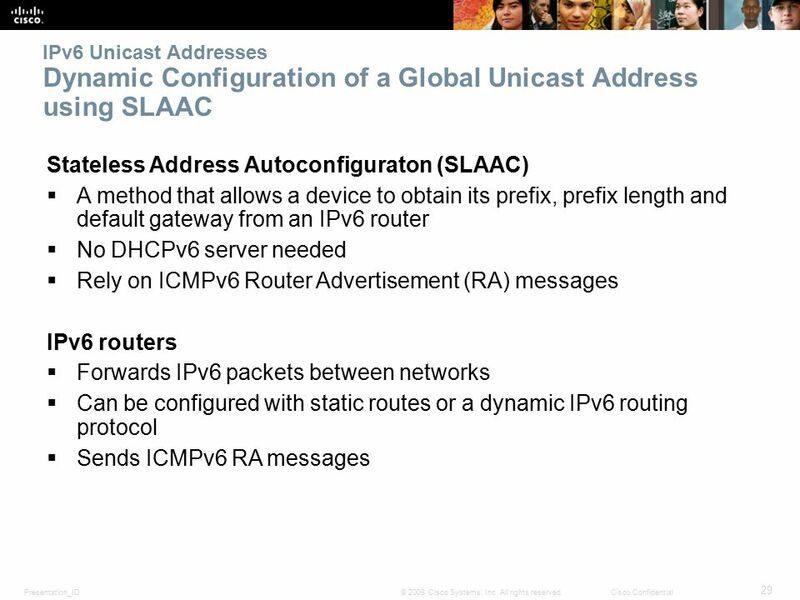 26 Presentation_ID 26 © 2008 Cisco Systems, Inc. All rights reserved.Cisco Confidential IPv6 Unicast Addresses Structure of an IPv6 Global Unicast Address (cont.)  Subnet ID is used by an organization to identify subnets within its site  Interface ID  Equivalent to the host portion of an IPv4 address.  Used because a single host may have multiple interfaces, each having one or more IPv6 addresses. 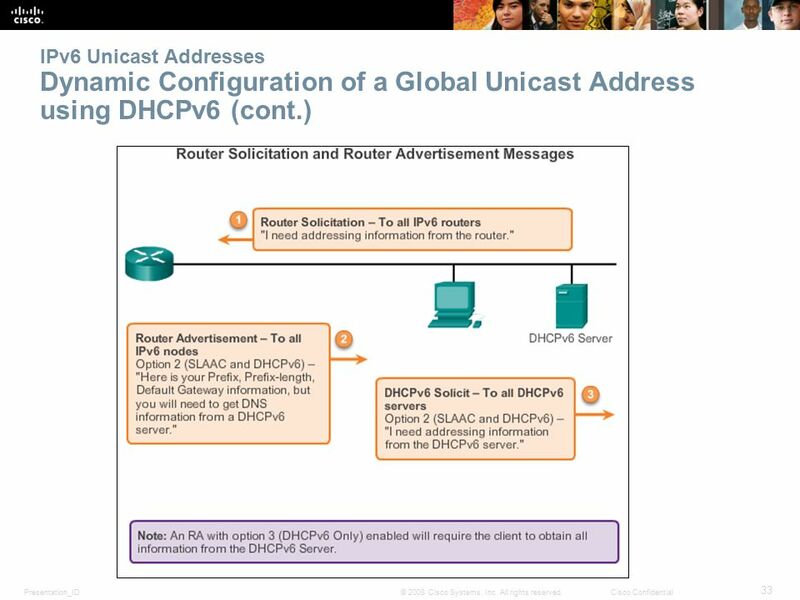 32 Presentation_ID 32 © 2008 Cisco Systems, Inc. All rights reserved.Cisco Confidential IPv6 Unicast Addresses Dynamic Configuration of a Global Unicast Address using DHCPv6 (cont.) 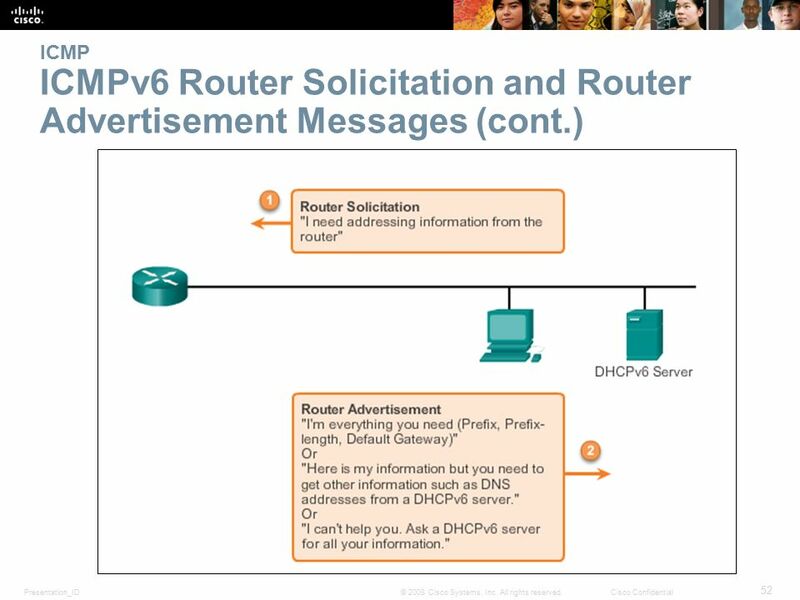 Dynamic Host Configuration Protocol for IPv6 (DHCPv6)  Similar to IPv4  Automatically receives addressing information, including a global unicast address, prefix length, default gateway address and the addresses of DNS servers using the services of a DHCPv6 server. 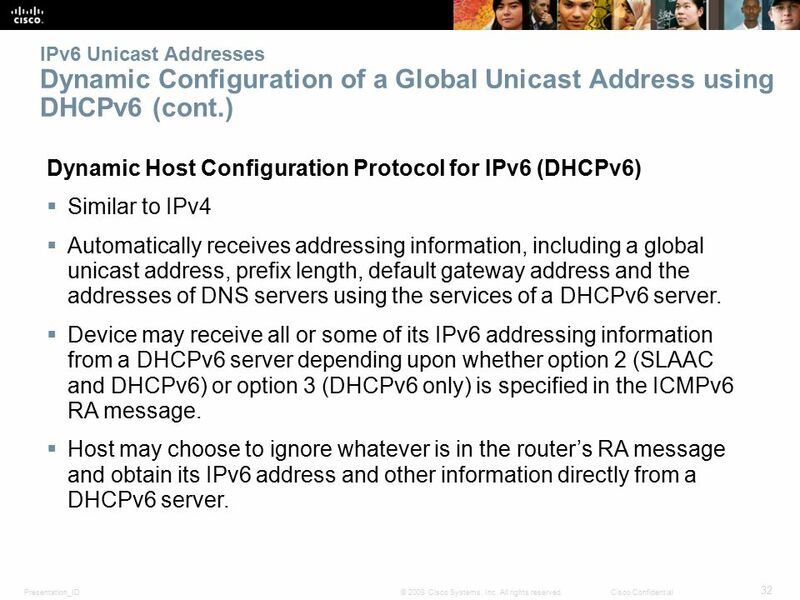  Device may receive all or some of its IPv6 addressing information from a DHCPv6 server depending upon whether option 2 (SLAAC and DHCPv6) or option 3 (DHCPv6 only) is specified in the ICMPv6 RA message.  Host may choose to ignore whatever is in the router’s RA message and obtain its IPv6 address and other information directly from a DHCPv6 server. 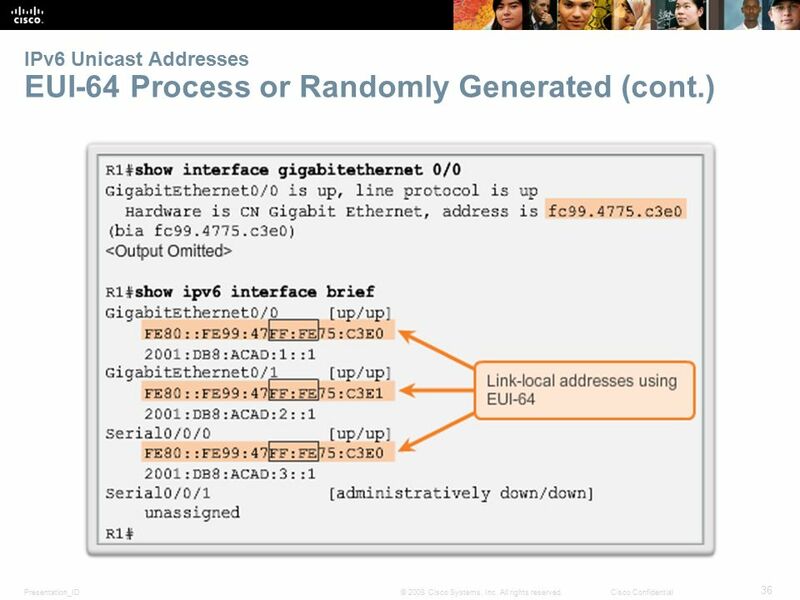 34 Presentation_ID 34 © 2008 Cisco Systems, Inc. All rights reserved.Cisco Confidential IPv6 Unicast Addresses EUI-64 Process or Randomly Generated EUI-64 Process  Uses a client’s 48-bit Ethernet MAC address and inserts another 16 bits in the middle of the 46-bit MAC address to create a 64-bit Interface ID.  Advantage is that the Ethernet MAC address can be used to determine the interface; is easily tracked. 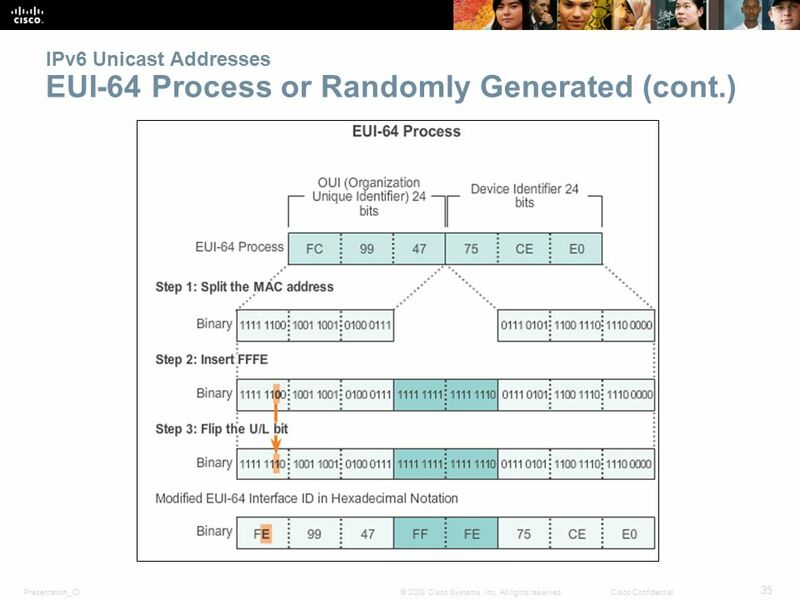 EUI-64 Interface ID is represented in binary and comprises three parts:  24-bit OUI from the client MAC address, but the 7 th bit (the Universally/Locally bit) is reversed (0 becomes a 1).  Inserted as a 16-bit value FFFE.  24-bit device identifier from the client MAC address. 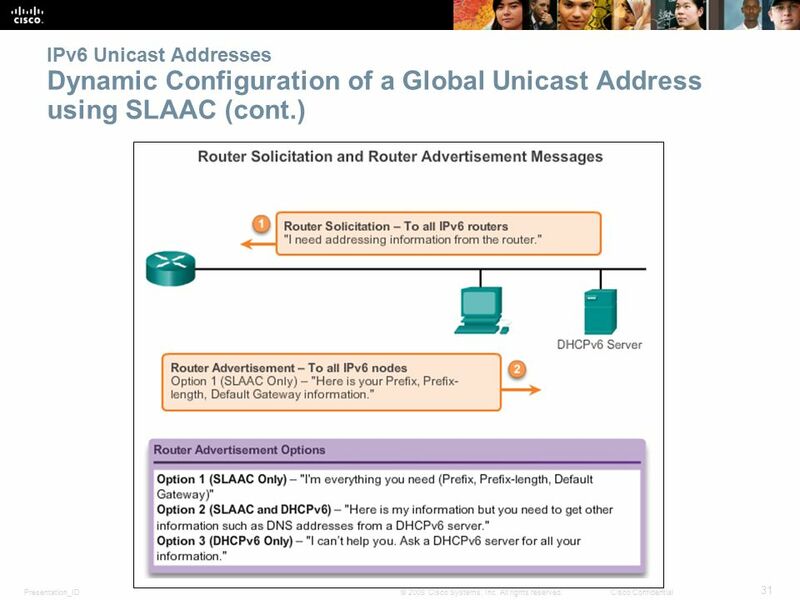 37 Presentation_ID 37 © 2008 Cisco Systems, Inc. All rights reserved.Cisco Confidential IPv6 Unicast Addresses EUI-64 Process or Randomly Generated (cont.) 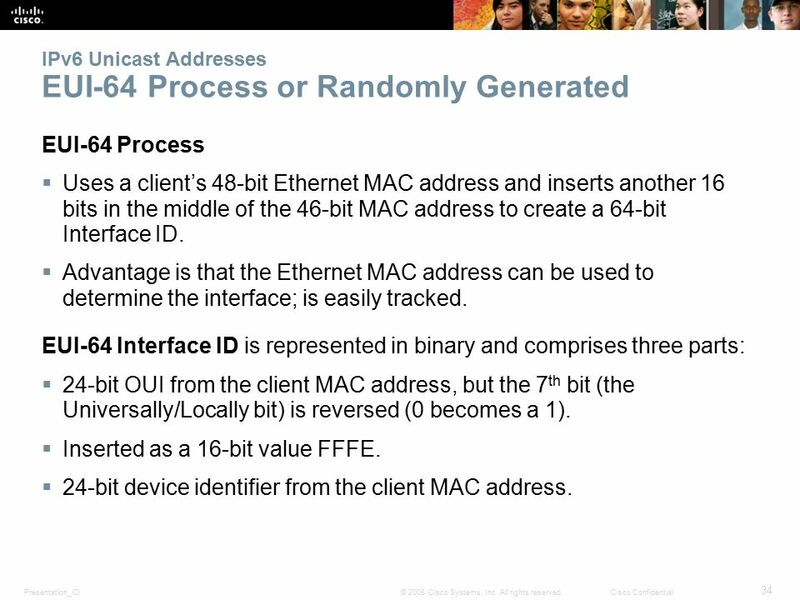 Randomly Generated Interface IDs  Depending upon the operating system, a device can use a randomly generated Interface ID instead of using the MAC address and the EUI- 64 process. 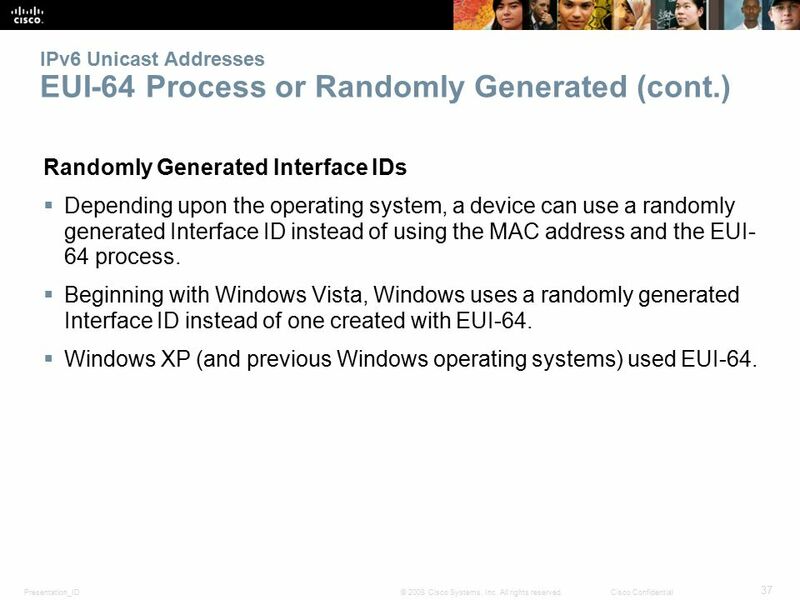  Beginning with Windows Vista, Windows uses a randomly generated Interface ID instead of one created with EUI-64.  Windows XP (and previous Windows operating systems) used EUI-64. 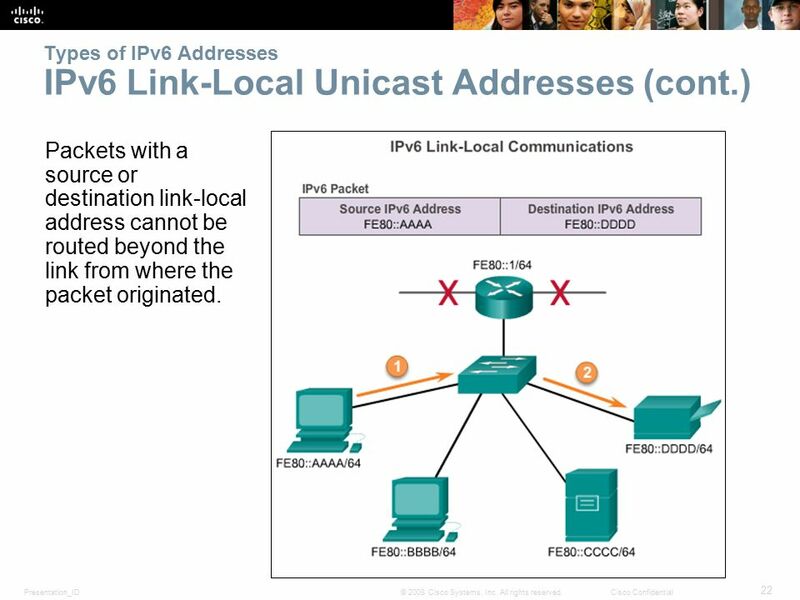 38 Presentation_ID 38 © 2008 Cisco Systems, Inc. All rights reserved.Cisco Confidential IPv6 Unicast Addresses Dynamic Link-local Addresses Link-Local Address  After a global unicast address is assigned to an interface, an IPv6- enabled device automatically generates its link-local address.  Must have a link-local address that enables a device to communicate with other IPv6-enabled devices on the same subnet. 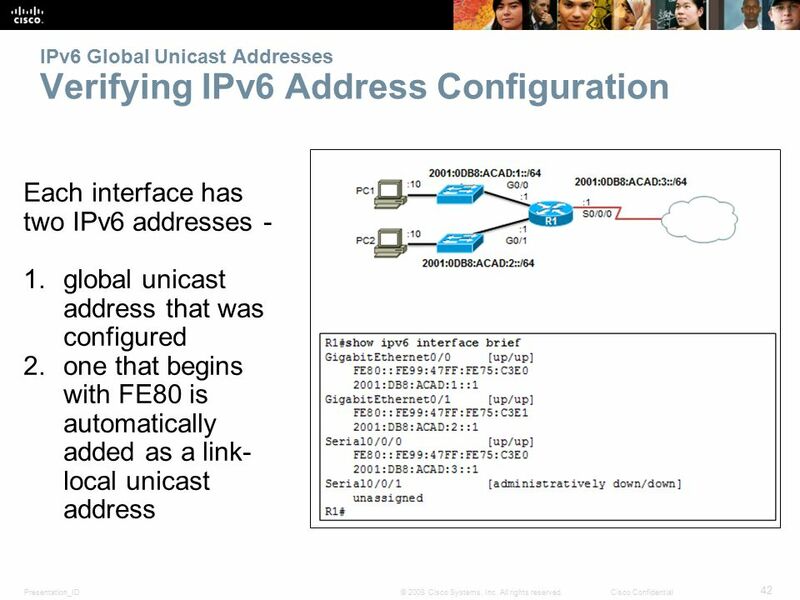  Uses the link-local address of the local router for its default gateway IPv6 address.  Routers exchange dynamic routing protocol messages using link- local addresses.  Routers’ routing tables use the link-local address to identify the next- hop router when forwarding IPv6 packets. 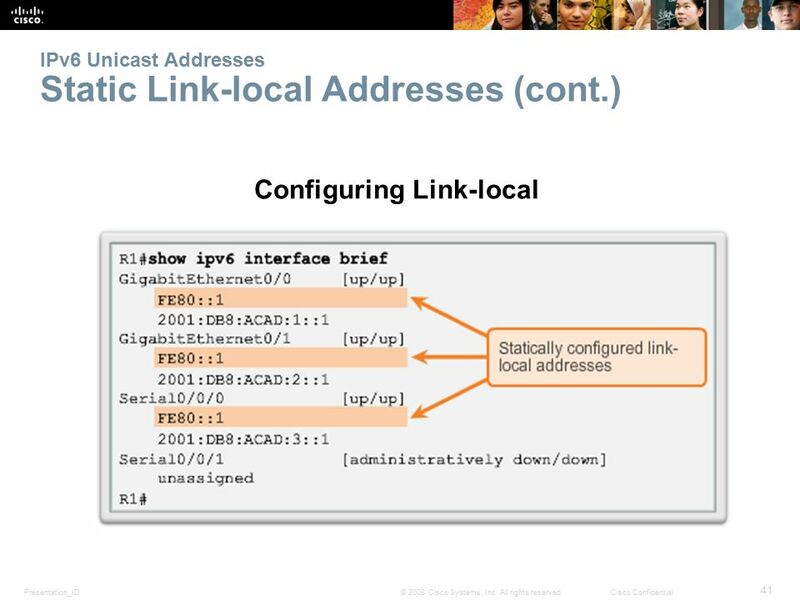 39 Presentation_ID 39 © 2008 Cisco Systems, Inc. All rights reserved.Cisco Confidential IPv6 Unicast Addresses Dynamic Link-local Addresses (cont.) 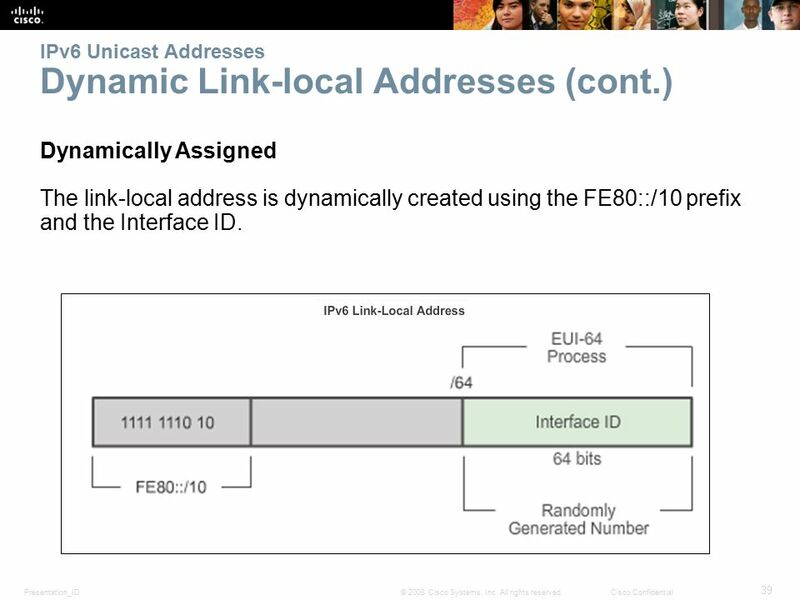 Dynamically Assigned The link-local address is dynamically created using the FE80::/10 prefix and the Interface ID. 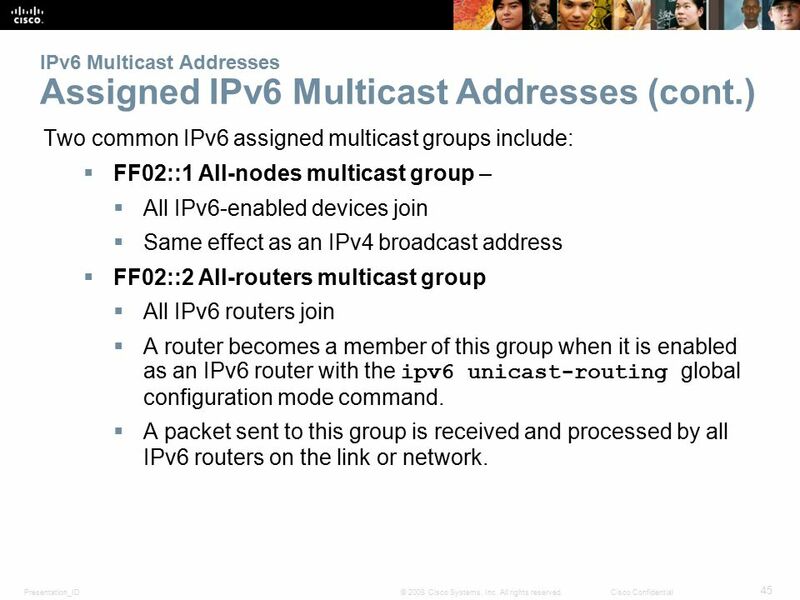 45 Presentation_ID 45 © 2008 Cisco Systems, Inc. All rights reserved.Cisco Confidential IPv6 Multicast Addresses Assigned IPv6 Multicast Addresses (cont.) 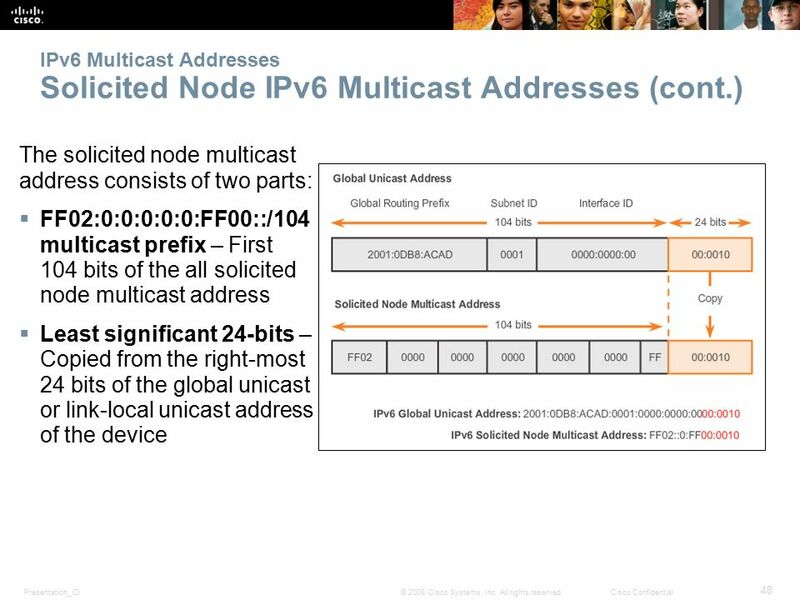 Two common IPv6 assigned multicast groups include:  FF02::1 All-nodes multicast group –  All IPv6-enabled devices join  Same effect as an IPv4 broadcast address  FF02::2 All-routers multicast group  All IPv6 routers join  A router becomes a member of this group when it is enabled as an IPv6 router with the ipv6 unicast-routing global configuration mode command.  A packet sent to this group is received and processed by all IPv6 routers on the link or network. 50 Presentation_ID 50 © 2008 Cisco Systems, Inc. All rights reserved.Cisco Confidential ICMP ICMPv4 and ICMPv6 Messages  ICMP messages common to both ICMPv4 and ICMPv6 include:  Host confirmation  Destination or Service Unreachable  Time exceeded  Route redirection  Although IP is not a reliable protocol, the TCP/IP suite does provide for messages to be sent in the event of certain errors, sent using the services of ICMP. 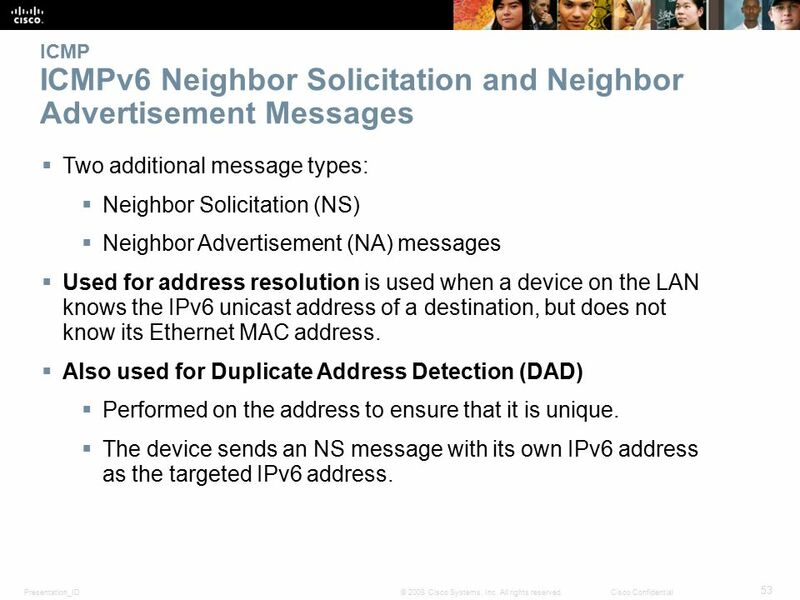 51 Presentation_ID 51 © 2008 Cisco Systems, Inc. All rights reserved.Cisco Confidential ICMP ICMPv6 Router Solicitation and Router Advertisement Messages  ICMPv6 includes four new protocols as part of the Neighbor Discovery Protocol (ND or NDP):  Router Solicitation message  Router Advertisement message  Neighbor Solicitation message  Neighbor Advertisement message  Router Solicitation and Router Advertisement Message – Sent between hosts and routers. 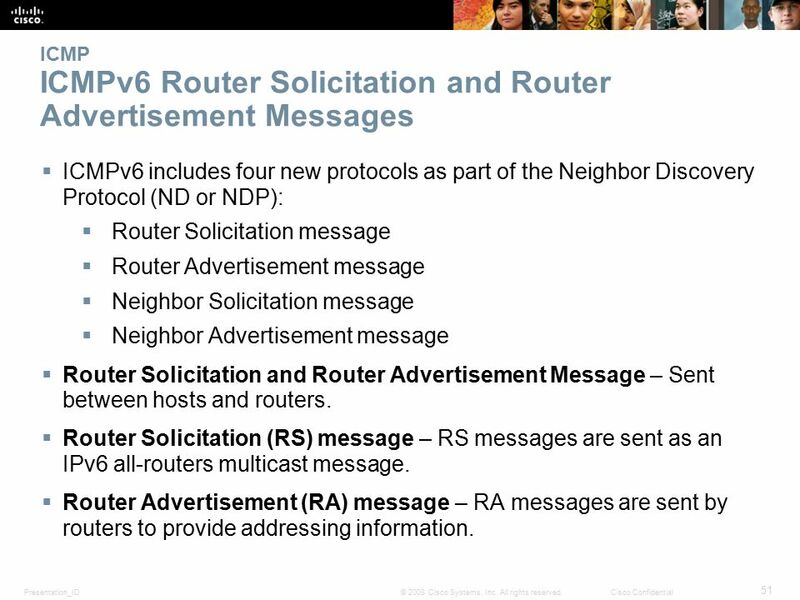  Router Solicitation (RS) message – RS messages are sent as an IPv6 all-routers multicast message.  Router Advertisement (RA) message – RA messages are sent by routers to provide addressing information. 53 Presentation_ID 53 © 2008 Cisco Systems, Inc. All rights reserved.Cisco Confidential ICMP ICMPv6 Neighbor Solicitation and Neighbor Advertisement Messages  Two additional message types:  Neighbor Solicitation (NS)  Neighbor Advertisement (NA) messages  Used for address resolution is used when a device on the LAN knows the IPv6 unicast address of a destination, but does not know its Ethernet MAC address.  Also used for Duplicate Address Detection (DAD)  Performed on the address to ensure that it is unique.  The device sends an NS message with its own IPv6 address as the targeted IPv6 address. 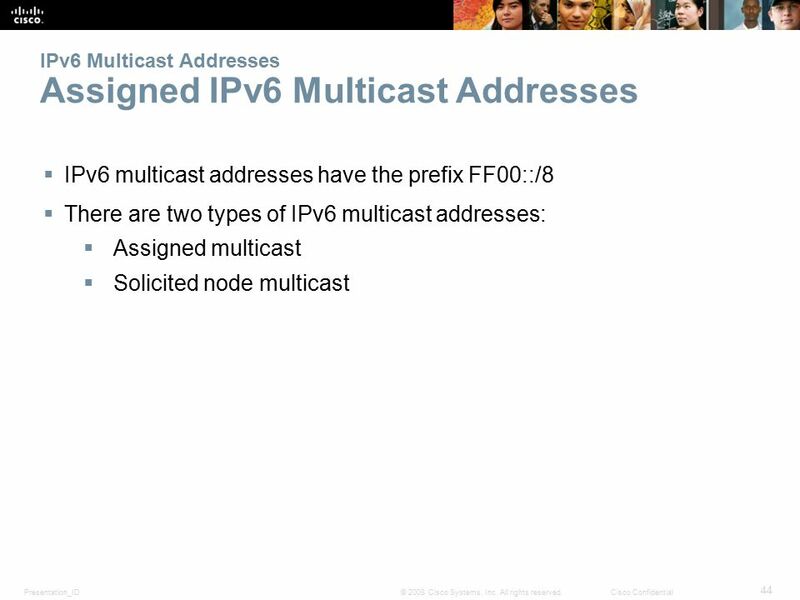 58 Presentation_ID 58 © 2008 Cisco Systems, Inc. All rights reserved.Cisco Confidential Subnetting an IPv6 Network Subnetting into the Interface ID IPv6 bits can be borrowed from the interface ID to create additional IPv6 subnets. 59 Presentation_ID 59 © 2008 Cisco Systems, Inc. All rights reserved.Cisco Confidential IP Addressing Summary  Each IPv6 address has 128 bits verses the 32 bits in an IPv4 address. 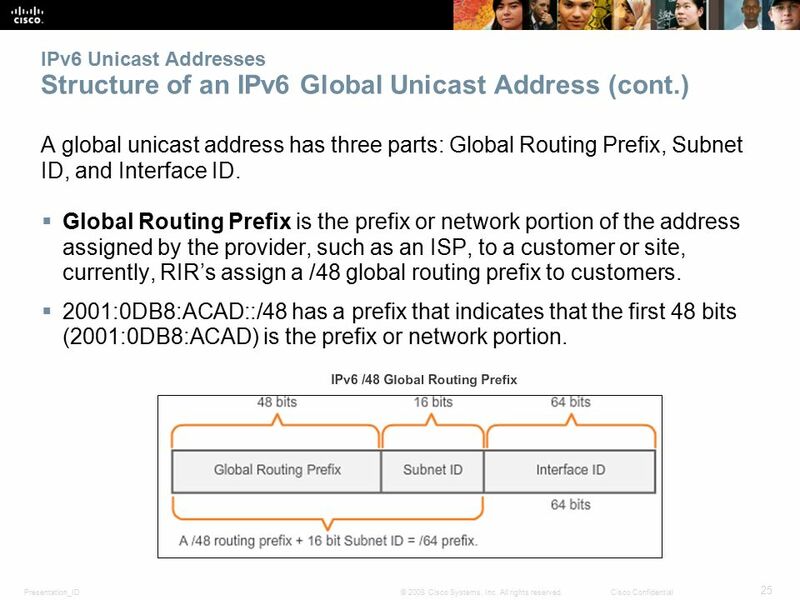  The prefix length is used to indicate the network portion of an IPv6 address using the following format: IPv6 address/prefix length  There are three types of IPv6 addresses: unicast, multicast, and anycast.  An IPv6 link-local address enables a device to communicate with other IPv6-enabled devices on the same link and only on that link (subnet).  Packets with a source or destination link-local address cannot be routed beyond the link from where the packet originated. 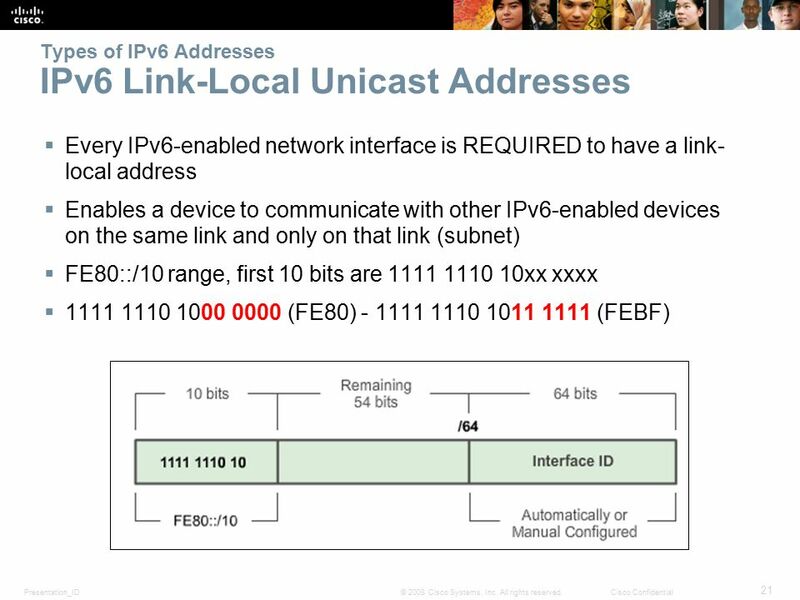  IPv6 link-local addresses are in the FE80::/10 range. 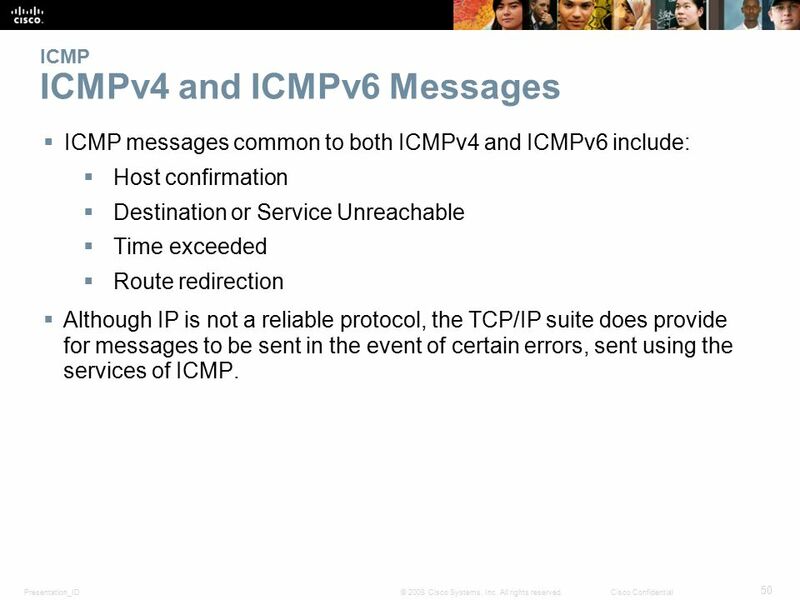  ICMP is available for both IPv4 and IPv6. 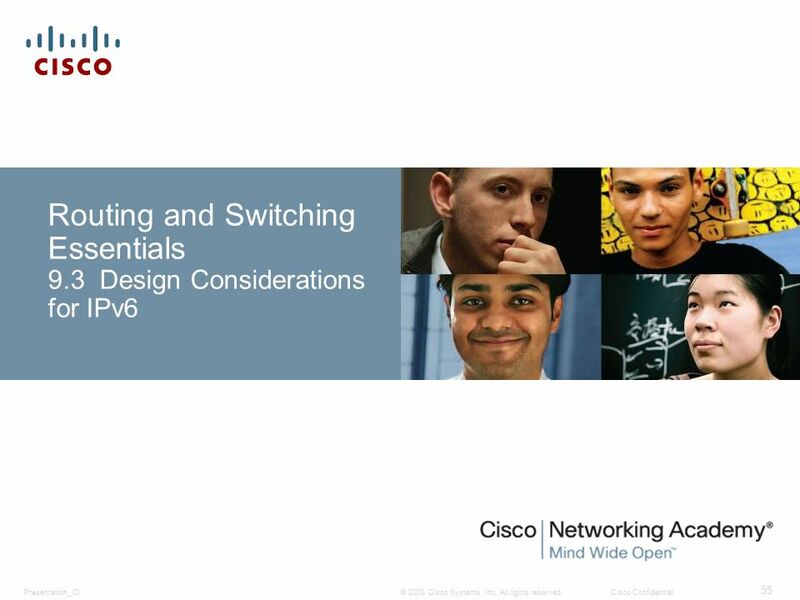 Download ppt "© 2008 Cisco Systems, Inc. All rights reserved.Cisco ConfidentialPresentation_ID 1 IPv6 Introduction to Networks & Routing and Switching Essentials." 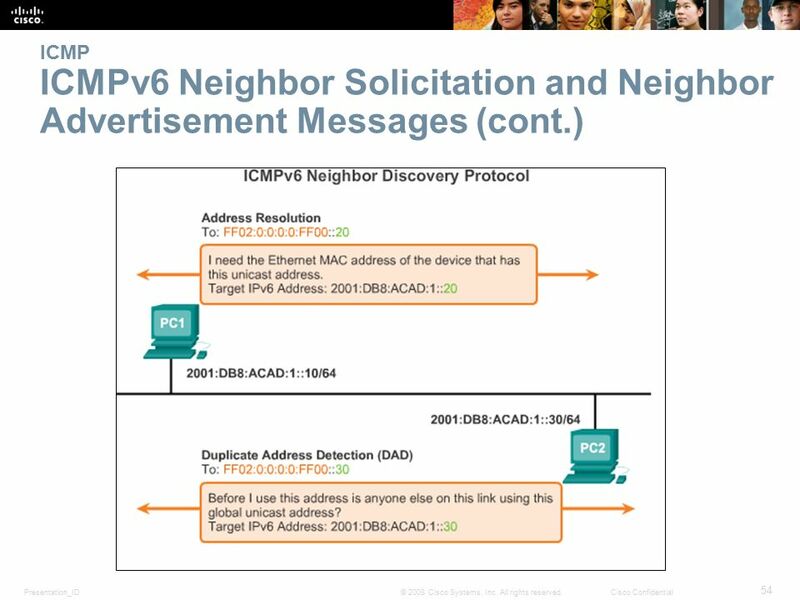 © 2006 Cisco Systems, Inc. All rights reserved.IP6FD v2.0—2-1 IPv6 Operations Defining and Configuring Neighbor Discovery. 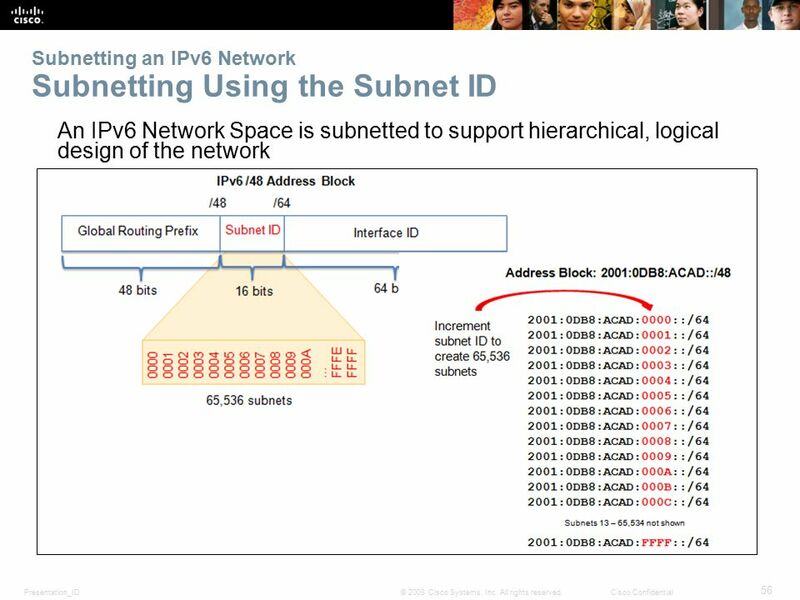 Chapter 19 Network Layer: Logical Addressing Stephen Kim. 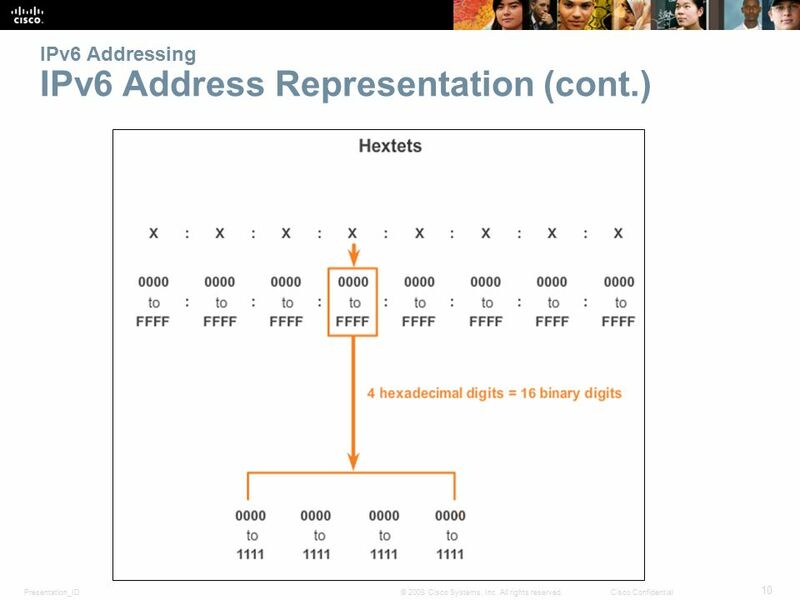 Network Layer: Logical Addressing. 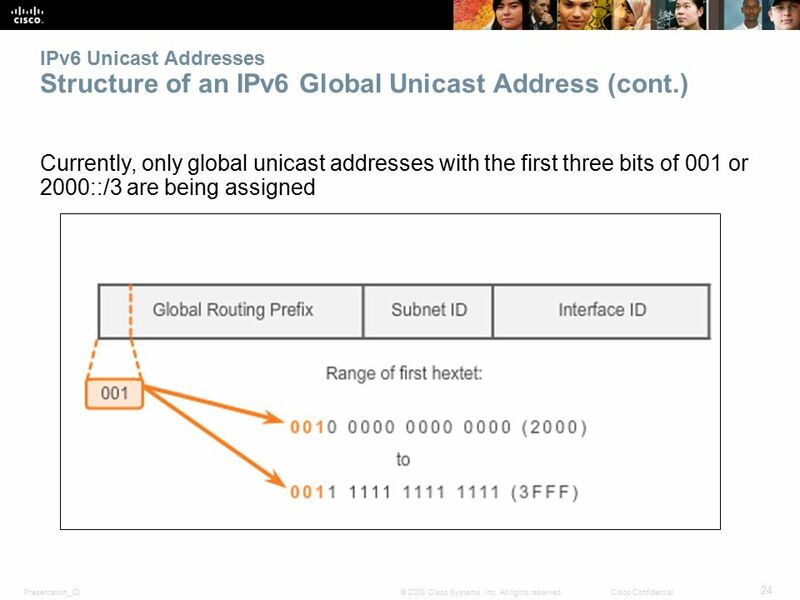 4-1 IPv4 ADDRESSES An IPv4 address is a 32-bit address that uniquely and universally defines the connection of a device. HELP! I Need to Learn IPv6! 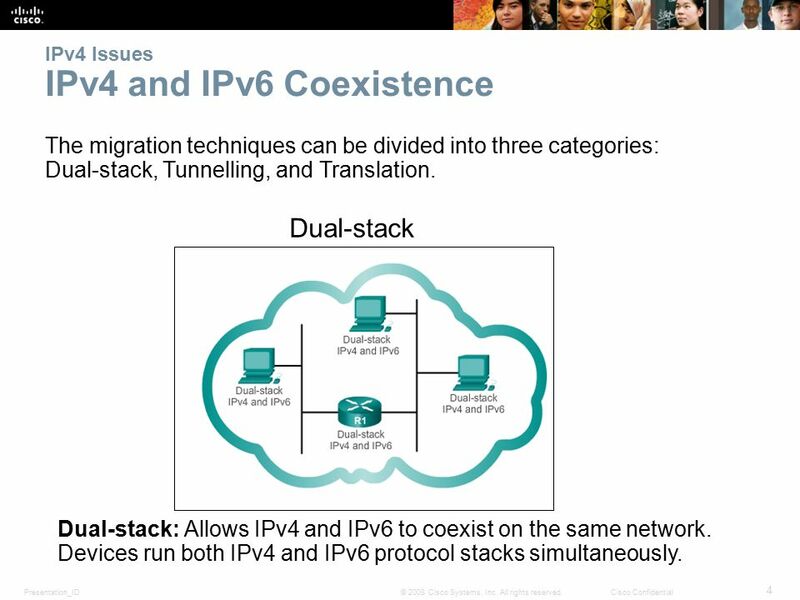 or 60 IPv6 Slides in 60 minutes! 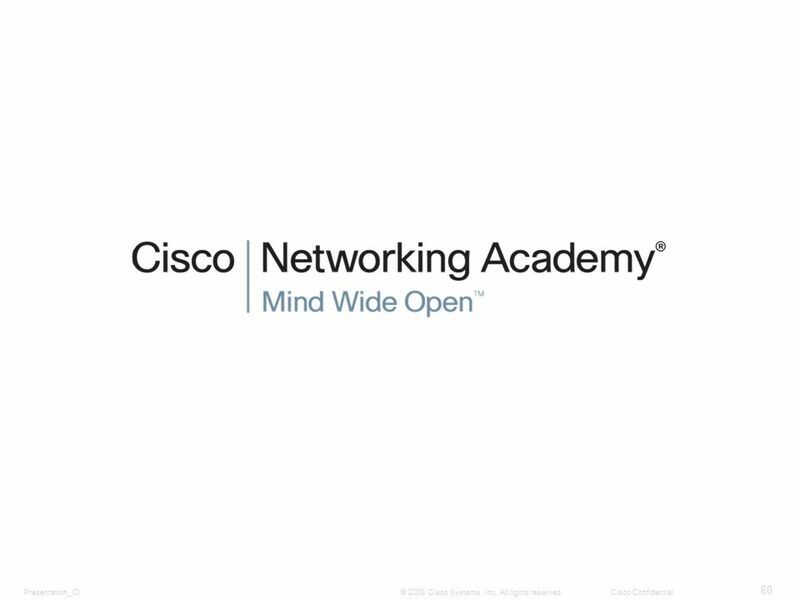 Chapter 8b Intro to Routing & Switching. 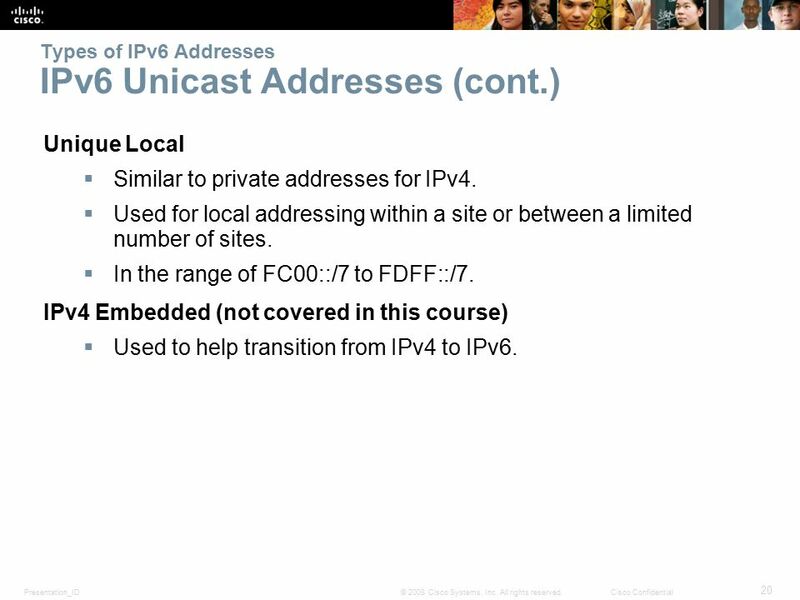  Upon completion of this chapter, you should be able to:  Describe the structure of an IPv4 address.  Describe. © 2007 Cisco Systems, Inc. All rights reserved.Cisco Public 1 Version 4.0 Network Addressing Networking for Home and Small Businesses – Chapter 5.